October 2, 2015, Victoria, BC (ISN) – The Univerity of Saskatchewan Huskies started the 2015-2016 CIS basketball season on the right foot with a 91-82 win over the Fraser Valley Cascades Friday night in the opening game of the 2015 Guy Vetrie Memorial Basketball Tournament that is being held at The University of Victoria. The game marked the first ever basketball game played in UVic’s brand new, $77-million Centre for Athletics, Recreation and Special Abilities (CARSA), a facility that now ranks as one of the nicest basketball venues in the land. In Friday’s opener, the Cascades and the Huskies treated the crowd to a close and evenly played first quarter that saw the Huskies lead for all of it, but hold just a 19-17 lead at the break. They would extend that lead to eight, 47-39 at the half, but the Cascades would regroup and the two teams again played even-up basketball in the third and fourth quarters, with the Huskies outscoring the Cascades by just one in the half 44-43, to close out the 91-82 win. Saskatchewan’s Juaquin Bennet-Bore led all scorers with 28 points, while teammate Evan Ostertag chipped in 18. For Fraser Valley, Kevon Parchment, with 19 and Nate Brown, with 18, led the way, while Vijay Dhillon had 14, including three baskets from the three-point line. 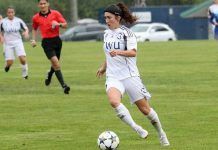 The teams continue at the Vetrie Memorial with the Huskies meeting the UVic Vikes at 7:00 pm on Saturday and the defending CIS Champion Carleton Ravens at Noon on Sunday. The Cascades will see Carleton at 3:00 pm on Saturday and UVic at 2:00 pm on Sunday.